NEWLY UPDATED INTERIOR! See brand new photos of this interior design project. South Tampa secluded waterfront home on rare 0.75 Acre lot with 330+ feet on the canal with direct access to Tampa Bay. 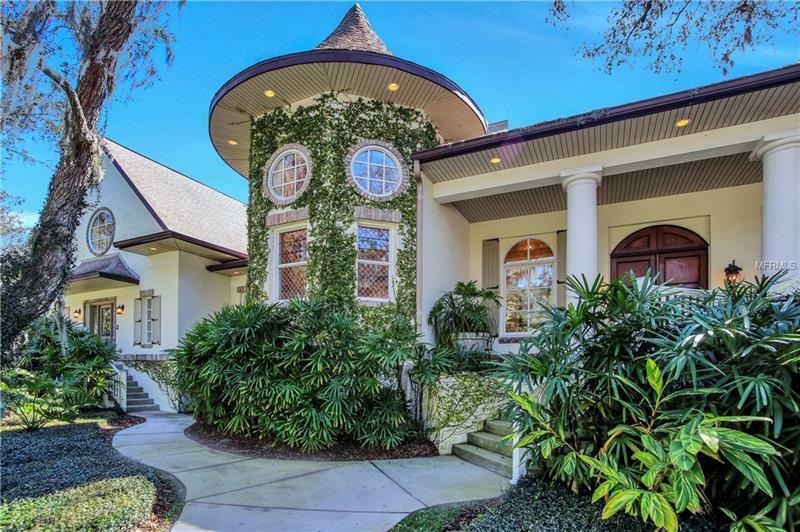 This homeâs ideal location provides a very private estate setting uncommon to other urban homes. A stunning double door entry invites you to light-filled living spaces with soaring ceilings, architectural beams, hardwood floors, tower room, plus a large office with separate entrance . A large kitchen features custom updated cabinetry, top-of-the-line appliances (Wolf/Thermador/Fisher-Paykel) large island/breakfast bar and Butlerâs pantry with wine refrigeration. A first floor master suite boasts soaring ceilings, sitting area and two master bathrooms and closets, enjoying its own serene sitting area with water views of dolphins, manatees, hawks and pelicans, and private decks. The first floor guest suite includes 2 bedrooms, 1 bath, living room and kitchen. The 2nd floor features 2 bedrooms, 2 full bathrooms with 2 walk-in closets, a play room and a project/storage room. A 220 sf separate utility building (not included in living area) is behind the pool, next to the dock. Other features include Zephiro stone fireplace and imported Italian pizza oven, covered porches, leaded glass windows, pool, and custom cabinetry. Canal was dredged in 2014 and a boat lift can be added to existing dock. Recent updates include interior repainting, Kitchen cabinets, light fixtures, carpet and more! See attachment for list.